Desperate Times - New Course Of Action (Ratel/Last Warning) - Both musically and lyrically, this album is a beast entirely and definitely some of the most powerful stuff ever recorded by a Polish band. There have been some line-up changes since their previous ep and this is first record with new vocalist, but it didn't hurt them a bit. The music is tight from start to finish and vocals rip it. 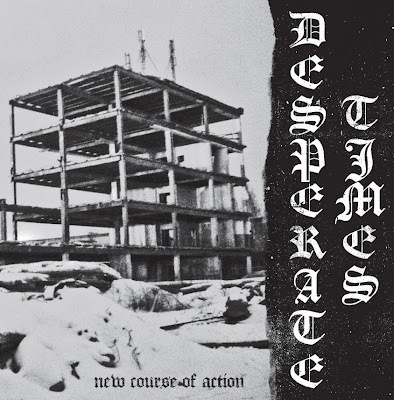 All the tracks are banging with the perfect combination of bold and aggressive NYHC with dark and gritty Clevo sound. Tons of energy with some upbeat riffs over vibrant drums and hard-hitting bass. The vocals flow over it nicely, the dude has a forceful voice which commands respect. You couldn’t ask for a better opening song than Corner Stone, but the remaining 3 tracks are crazy as well. I'm not even sure how to describe it besides dope.